New Delhi, March 25: The list of 26 candidates in Maharashtra and West Bengal for the upcoming Lok Sabha Election was announced by the Congress on Monday. Congress released the names of candidates for one seat from Maharashtra and 25 from West Bengal. 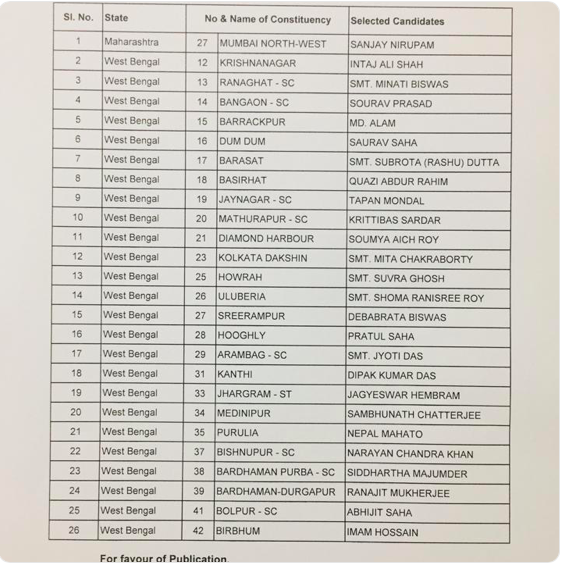 This is the 10th list of candidates the Congress has released for the Lok Sabha poll and with this, the party has announced a total of 253 candidates so far. Sanjay Nirupam has been fielded from Mumbai North-West seat, the lone Maharashtra seat to be announced today. From West Bengal, Intaj Ali Shah, a former judge and former Chairman of Minority Commission in West Bengal, has been given a ticket from Krishnanagar. Sourav Prasad will fight from Bangaon, Mohammad Alam from Barrackpore, Mita Chakraborty from Kolkata Dakshin, Suvra Ghosh from Howrah and Pratul Saha from Hooghly, are some of the names on the list. Here’s the full list of the 26 candidates. Meanwhile, the Congress also named four candidates for assembly poll in Odisha. Next articleSnake? Seriously, what’re Deep Jandu, Karan Aujla doing with it?